I’ve been playing Ludo with my two children quite a bit recently. But standard Ludo is a 4-player game, which means lots of extra hopping around the blank segment when three of us play. I realised that each segment of the board is essentially a self-contained area, and that it would therefore be possible to come up with a modular design to allow as many or as few players as you like. 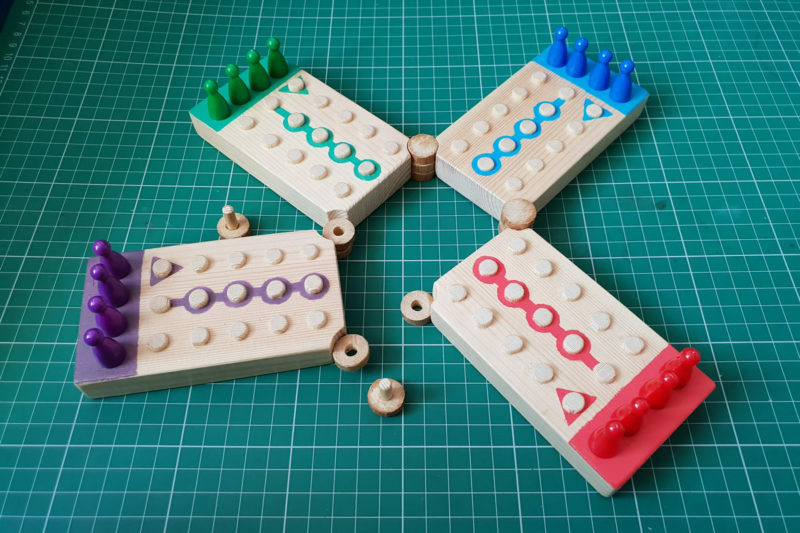 I came up with a system of hoops and pegs to allow the modules to be easily added or removed while the whole board is sturdy enough for children to play with. I’m a very amateur woodworker, so it was interesting to see the noticeable improvement in quality of finish as I built each module.